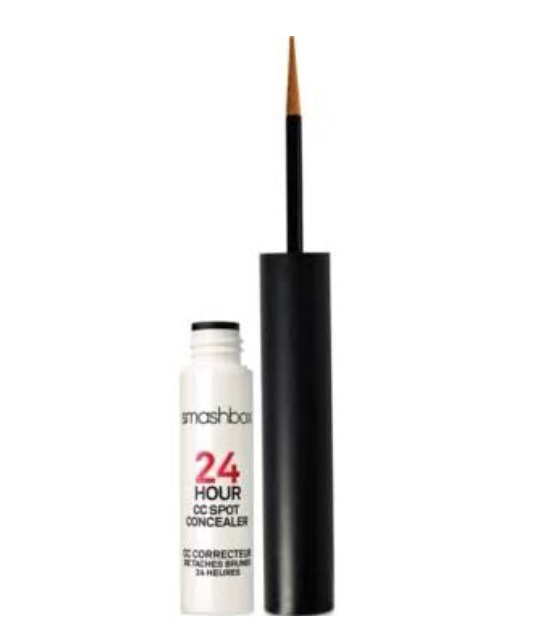 Smashbox Concealer is a Coverup! As a background, I should tell you that I discovered the brand tarte on QVC years ago and I fell in love! So I do like to watch HSN & QVC cosmetic episodes just to get a feel for what I might like. They also launch new brands and I love to watch those. What I like about these programs is that they are LIVE so it’s a little more difficult to hide something that doesn’t work well. You can see some amazing results or you may see that the products aren’t so great. It’s not as full-proof as going to a store and swatching it yourself, but for me it’s the next best thing. Before I left for vacation, I scheduled two recordings on HSN one selling Smashbox and the other selling it cosmetics. I finally got a chance to sit down and watch. Needless to say, it’s not at all waterproof, which I would be completely ok with because a truly waterproof product is hard to come by. What I did have a problem with was the whole scene being covered up by the representative’s hand and then she proceeded to state “what you’ll see is just that the product stays in place” WHAT? No, what I saw was it being smeared all over your hand and you tried to hide it. Maybe I am being too critical and I DO NOT plan on writing off Smashbox because they do have some great products. Other than the waterproof mishap, the concealer seemed to work pretty well. I totally get it the whole sales pitch part, but this was so blatant that I feel duped or lied to. People can perceive what they see very differently so I would love to hear some feedback!! That is so embarrassing but I’m laughing at her face while she’s trying to hide it lol. I love qvc but I’m also one to Google and read reviews from everywhere and find honest opinions of products. So I research a ton before I buy. Honestly, I use bye bye under eye from it cosmetics in the waterproof version and I would say it’s only like…rain proof. I couldn’t put water on my finger and smudge and it would stay, I don’t think any product does that, so she’s foolish for even trying to attempt that lol. I know. lol. I really couldn’t believe what I saw. She was obviously shady as she look around while wiping it off. I agree 100% that it’s important to research a product before purchase. That is how I landed in the beauty blog world, I wanted to give an honest review and maybe help people (like us) who like to research. Thanks for the recommendation, I will definitely try bye bye under eye I really like it Cosmetics in general. Waterproof really wasn’t important to me, and I would have bought the Smashbox concealer without the waterproof property until I saw that mess.